Our team will be driving two vehicles: a work truck towing a trailer with tools and equipment, and a large dump truck towing our excavator. We use the excavator to dig the hole and sometimes lift and set the pool. Depending on access a crane is used most often. A skid steer loader is used to move dirt and gravel. The first thing the crew will do is paint the pool on the ground and use a laser level to establish the height to set the pool in the yard. This will tell us how deep to dig the hole. We'll then position the dump truck close to the hole (if needed) and begin excavation. While one crew member digs the hole the others begin to work on lay out of the pump and filter system. Excavation of the hole usually takes between 6 -8 hours and depending on the size of the hole and how long it takes to dispose of the dirt. After the excavation is complete, we install a 4" socked big O under the deepest part of the pool leading to a 8" surface pipe. 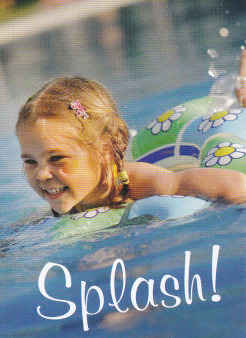 This alleviates any water ground presure and it allows for future servicing that requires the pool to be drained. We then place a 3 1/2" thick layer of limestone gravel in the hole which the pool will rest on. This gravel base determines the height of the pool so we use a laser level to set the gravel at precisely the right elevation. We are usually at this point at the end of day two or the beginning of day three of construction. It's important to note that we use gravel instead of sand for our installations...let's talk about why. Sand vs Gravel for Installation: Which is Better? Back in the early 2000's, we installed roughly our first 10 on sand. Over the following years we found that a certain percentage of these pools had problems such as pool settlement, bulges in the side walls of the pool, and leaks in fittings and plumbing around the outside of the pool. We determined all of these issues resulted from using sand…and if you consider the properties of sand, it makes sense why. First, sand liquefies when saturated with water. What do you think will happen to a pool filled with water that weighs tens of thousands of pounds and is resting on bed of liquid? Doesn't sound to re-assuring does it? Secondly, when backfilling around the outside of a pool with sand it’s almost impossible to compact that sand 100%. What do you think happens over the following 18 months when the sand backfill finally settles? It puts pressure on the side walls of the pool and the plumbing that it encases. This causes the fittings the plumbing is connected to leak. The weight of the saturated sand on the side walls of the pool can also cause them to bulge inward. We eventually switched from sand to gravel backfill and the moment we did so all of these problems vanished. We haven’t had a single fitting leak, wall bulge, or pool settle in our past 35 pools and counting. Okay, now that our gravel base is laid we are ready to set the pool in the hole. Basically, the entire pool floor must rest on a solid foundation to insure the pool is structurally sound. This prevents it from shifting and settling over time. Our team will strive to achieve our goal of getting the pool withing one-half inch of level, all while insuring the entire pool floor rests firmly on the gravel foundation. We feel it's important for anyone considering a fiberglass pool to know that these pools are never perfectly level. Again, our goal is to get every pool within a half-inch. 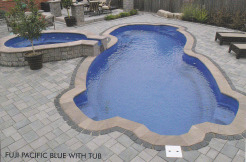 The industry standard is one inch, but it's not uncommon to see fiberglass pools far more out of level than that. To insure the pool is to our standards, our team will repeatedly lift and re-set the pool shell as many times as needed. A common mistake is to rush this critical phase of the process which only leads to pools being out of level or eventually shifting or settling due to the pool shell not resting on a proper foundation. We usually have the pool in the hole and level by the end of day three or by the end of day four depending on the project.